ROTHKRICH CARTOON-FILM started its business in animated film production in 1985 as a one-man company. Today, about 40 artists and CGI specialists work in the studio of Thilo Graf Rothkirch and Maya Gräfin Rothkirch in Berlin. Most of them trained at ROTHKIRCH CARTOON-FILM. ROTHKIRCH CARTOON-FILM also works with free artist and contractors form Germany and other European and non-European countries. 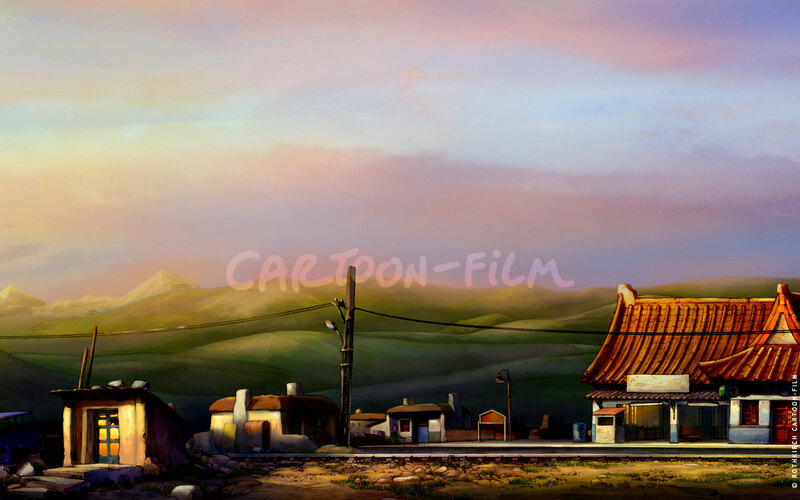 CARTOON-FILM is specialized in 2D as well as 3D CGI Animated motion picture productions. Thilo Graf Rothkirch and Maya Gräfin Rothkirch maintain International cooperation since the beginning of the nineties. The initiatives of the Cartoon/Media Brüssel in form of grants for pilot films, Pre-Productions, and even organized training courses were used by CARTOON-FILM from the beginning. Together with the Honeycomb Animation Studios (UK) and Duboi (Paris) E-Toons was launched in 1990, one of the first European Studio groupings. In co-production with studios in England, Belgium and Germany, two projects have emerged: The Series Feodor for ZDF and ITEL and the movie Tobias Totz. A number of productions of ROTHKIRCH CARTOON-FILM are based on own ideas and designs. Since the production of the children’s television series Tobias Totz and his Lion (1988-96), Otto, the street dog (1989) with WDR and Lisa and Paul (1992/93) with ZDF, the charming style of ROTHKIRCH CARTOON-FILM enchants the international market. The first movie Tobias Totz and his Lion with Warner Bros. as a distributer was awarded with the GOLDEN SPARROW of Gera and a nomination for the GERMAN FILM AWARD in 2000. Since then ROTHKIRCH CARTOON-FILM can build on a close cooperation with Warner Bros. Entertainment GmbH and the Warner Bros. Film distribution. The Little Polar Bear was the first co-production between ROTHKIRCH CARTOON-FILM and Warner Bros., and with over 2.8 million admissions, the most successful German children’s animation film. The TV series The Little Polar Bear was nominated in 2003 for the International EMMY AWARD. ROTHKIRCH CARTOON-FILM has become one of the most successful, European children’s film producer. In addition to that ROTHKIRCH CARTOON-FILM wants to conquer with co-productions with China and India the Asian market. 2007 ROTHKIRCH CARTOON-FILM was awarded with the PULCINELLA AWARD as the best international studio. Rothkirch Cartoon-Film GmbH specializes in adapting children’s literature and classics in high quality 2D or 3D animated feature films such as Laura’s from Klaus Baumgart, which was rewarded with the GERMAN FILM AWARD in 2005. Little Dodo, also based on a book of Hans De Beer and Serena Ceccherini, has been released theatrically in January 2008. Maya Gräfin Rothkirch and Thilo Graf Rothkirch have made it their goal to produce high-quality cinema films for family entertainment that address the needs of the world market and are tuned, above all, to children’s viewing habits. And they attach great importance to carefully developing not only the stories, but also the backgrounds and digital effects, which are so decisive in creating a film’s atmosphere. When it comes to music, Rothkirch Cartoon-Film’s productions are already in the world-class bracket with compositions by Oscar winner Hans Zimmer and Nick Glennie-Smith for both Laura’s Star and The Little Polar Bear 2 – The Mysterious Island. In 2009, Laura and her star were back again on the big screen. In September last year they made a trip to China, finding new friends and big adventures. Laura’s star & the mysterious Dragon Nian was another successful co-production with Warner Bros: a new adventure based on the successful books by Klaus Baumgart, for all Laura fans with a melodic score, played by internationally acclaimed pianist Lang Lang. Even after that it was more exciting for Laura. In autumn 2011 she and her Star where in a new adventure with the dream monsters. With Laura’s Star and the Dream Monsters ROTHKIRCH CARTOON-FILM produced again a loving kids movie for the first time in 3D stereo, based on ideas by Klaus Baumgart. In September 2013 the new 3D stereo animated feature film Rabbit Without Ears and Two-Eared Chick has been released theatrically. The movie is based on the well-known children’s books by Til Schweiger and Klaus Baumgart and was produced in coproduction with Warner Bros. Entertainment and Barefoot Films. Besides the charming characters to whom the famous German actors Emma Schweiger, Til Schweiger and Matthias Schweighöfer gave their voices the colourful world of the movie is accompanied with songs full of atmosphere.